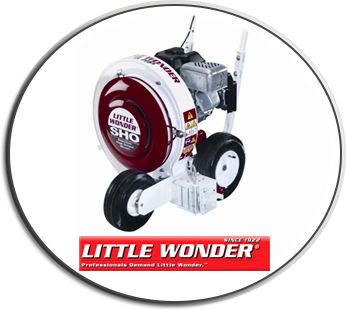 Little Wonder is one of the oldest and most reputable brands in the landscaping industry. Born in the United Kingdom in 1922, the product name of the world's first hedge trimmer, the "Little Wonder" Trimmer was created to be a hand-cranked hedge trimmer. Oddly enough, the product found a strong customer base in the food industry. Pasta makers trusted the unit's razor sharp hand finished blades to slice their delicate fresh pasta into strips. In 1935, the brand immigrated to America, via an acquisition by Pennsylvania based, Schiller-Pfeiffer. The rest is an American success story. Little Wonder has introduced many of the landscape industries most beloved and trusted products. Little Wonder produced the world's first electric-powered hedge trimmer in 1940, followed by the world's first gasoline-powered unit in 1955. Little Wonder even invented the world's first "hand-held" tiller and coined the terms "Roto" and "Mini" Tiller in the 1970's. In 1997 (75 years young), Little Wonder revolutionized debris management with the introduction of a newly redesigned line of walk-behind blowers. Input from independent airflow-design engineers was instrumental in creating a new product line that far surpassed the performance of all other walk-behind blowers on the market. So much so, that a patent for the design was granted in 1998. Today, Little Wonder product lines include: blowers, edgers & bed shapers, leaf & debris vacuums, truck loaders, and, of course, hedge trimmers. Schiller Grounds Care, Inc.